She might have needed some help with the advertising before she came out with Land of Plenty , her Sichuanese cookbook. Compared to the Hunan book (Revolutionary Chinese Cookbook ), Land of Plenty seems decidedly low-budget. Anyhoo, the pictures in the Hunan book are glossy, thereby inspiring us to cook some more dishes from it. This is a simple home-style dish, perfect for those days when going meatless is our heart's desire. Although, there is nothing specifically Hunanese about this; it can live quite happily within a number of cuisines. 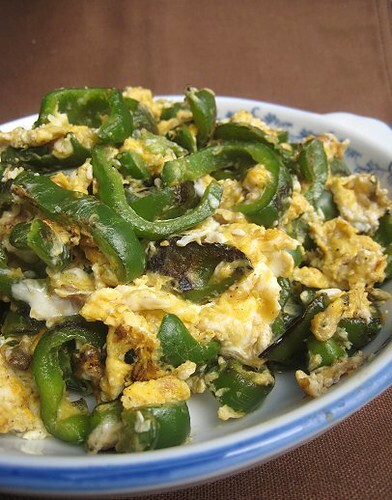 It really is as simple as cooking some green peppers, adding beaten eggs, and cooking some more. The key for me, however, is the "wok-hei" flavor of the peppers, not that I proclaim to know how to properly achieve wok-hei. But see how the peppers are a little bit charred? 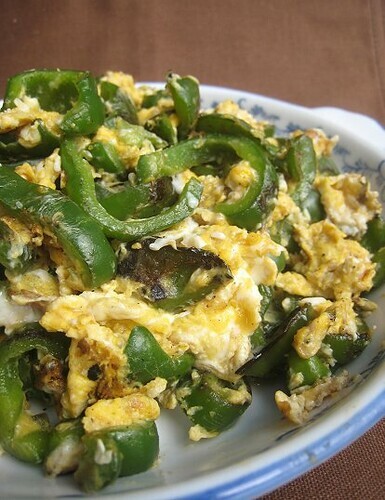 We used green bell peppers for this dish as per the recipe. 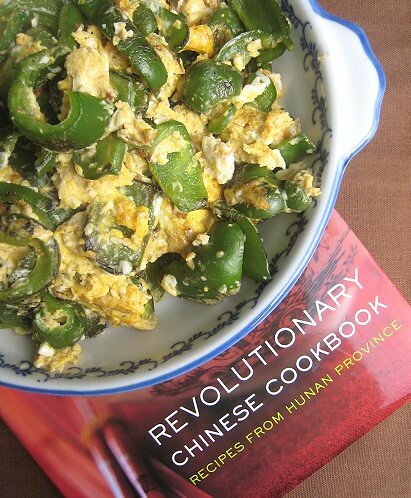 I recall reading in the book that the Hunanese use green peppers often in their cooking. 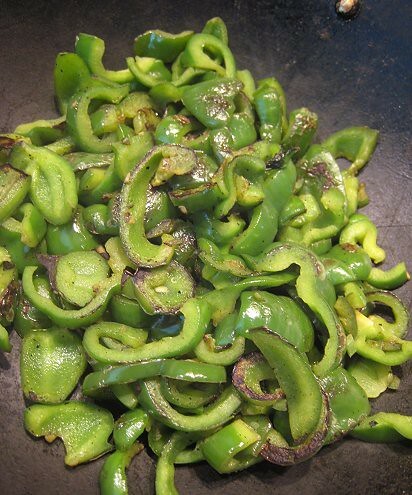 JS speculated that perhaps that is why we keep seeing small green bell peppers at our usual Asian supermarket. Perhaps they stock these as there seems to be more people from mainland China now (as opposed to people from Hong Kong or Taiwan like days of yore). In the introduction to the recipe, however, Fuchsia (first name basis) talks about the "lazy piquancy" of the peppers in this dish, and how she uses Turkish peppers with a "gentle hotness". Hmm, these bell peppers had no heat at all. When we ate a Hunan restaurant a couple of weeks ago, one of their dishes was "Pork with Green Chili", for which they used completely de-seeded and de-ribbed jalapeños. I assume this is because the green chiles they use in Hunan is not readily available here. I missed the hint of heat in this dish, so for next time, I think we'll go the seeded jalapeño route. Discard stems of the peppers and cut on an angle into bite-size chunks. Beat the eggs with salt to taste in a small bowl. Smear the wok with a little oil and heat over a medium flame. Add the bell peppers and stir-fry for about 5 minutes, pressing them against the side of the wok with your wok scoop/ladle, until they are fragrant and tender, their skins a little golden and puckered. Add the rest of the oil, and when it is hot, pour in the eggs and mix well. 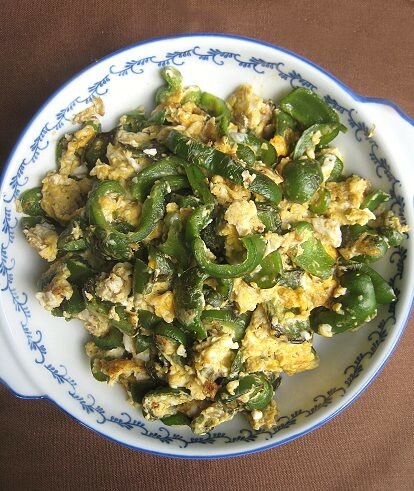 Scramble the eggs and peppers, adding a little more salt to taste, if necessary. Don't stir the eggs too constantly so they set into folds. When the eggs are just cooked, turn onto a serving dish. I bet this would be really great with a nice mix of jalapenos and green peppers so that the heat wasn't too overwhelming...but you are so right. Green bell peppers are just. Sweet. Definitely a great concept though...I've never stir fried eggs before! yeah, the French I guess did not think it necessary to teach us about Shakespeare. Dosto is great and he was a crazy man in real life too ! Yes, that was a great idea. Bell peppers + deseeded jalapeños it is! Desseding those jalapeños is so labor-intensive! LOL. I think that's the impression I got from reading just the one book.